Former middleweight champion Julio Cesar Chavez Jr. plans on fighting two months from now after a year off from activity, and he says e’s interested in facing Sergio Mora or Vanes Martirosyan. Chavez Jr. (50-3-1, 32 KOs) is trying to get his weight down after starting training at 220 lbs. His goal is to make 168 or 169 for his August 11th fight. He recently had to deal with an ankle sprain, so he’s coming off of that injury while trying to get his weight down. 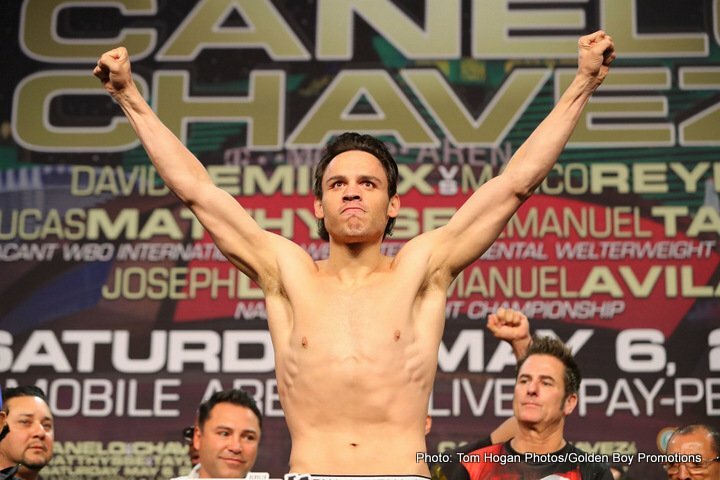 Chavez Jr. hasn’t looked good in many years since his win over Andy Lee in 2012, and it’s unclear what his goal in continuing to fight other than looking to get one last big payday. Chavez Jr. made good money in his fights against Sergio Martinez and Saul Canelo Alvarez, but unfortunately lost both. “We are training and working to reappear on August 11,” Chavez Jr. said to ESPN Deportes. “I had a sprain on my right foot but I started training well. I cannot say I have an opponent yet. We’re talking about Sergio Mora or Vanes Martirosyan. I want to come back at 168-169 pounds. It’s not a championship fight and I have a year of inactivity. I want to do this and another fight to find a big one,” Chavez Jr. said. Martirosyan (36-4-1, 21 KOs) was knocked out in the 2nd round by IBF/IBO/WBA/WBC middleweight champion Gennady ‘GGG’ Golovkin on May 5 on HBO. I don’t know if it’s feasible for the 32-year-old Martirosyan to get back into the ring and fight Chavez Jr. three months after that loss on August 11. Moreover, how much interest would boxing fans have in seeing Chavez Jr. fight Martirosyan right now? It might not be a worthwhile fight for Chavez Jr., because he has nothing to gain from that fight and plenty to lose. If Chavez Jr. struggles to beat Martirosyan, he’ll be compared unfavorably to GGG. If Chavez Jr. loses to Martirosyan, then it’s probably game over for him. There would be no point in Chavez Jr. continuing his career, which you can argue is already the case. Martirosyan has lost three out of his last four fights. 37-year-old former WBC light middleweight champion Sergio ‘Latin Snake’ Mora (29-5-2, 9 KOs) won his last fight in edging Alfredo Angulo by an 8 round split decision on April 7 in Las Vegas, Nevada. Mora did what he had to do to beat a very slow Angulo at super middleweight. Mora lost his two prior fights to Daniel Jacobs by knockout. Mora would be a better opponent for Chavez Jr. if he wants to impress the boxing public, but it’s also potentially a harder fight than the Martirosyan one. Chavez Jr. could lose to Mora. Losing to that level of an opponent would be a huge hint to Chavez Jr. that he needs to walk away from the sport. The 32-year-old was badly schooled by Saul Canelo Alvarez last year in losing a 12 round unanimous decision on May 6 on HBO pay-per-view. The fight was billed as a war, but it turned out to be a slow-paced fight with Chavez Jr. taking punishment for 12 rounds by Canelo. It was so one-sided that it looked like Canelo was taking it easy on Chavez Jr. through much of the fight. Chavez Jr. looked too weak to put up much resistance after having lost a lot of weight in training camp to get down to the 164.5 lb. catch-weight. That’s the catch-weight that Canelo’s promoters at Golden Boy wanted for the fight, and there was a large weight penalty attached. That obviously made it stressful for Chavez Jr. in taking off weight. In hindsight, it would have been better for Golden Boy and Canelo if they had simply let Chavez Jr. weigh whatever, because the fight would have been more interesting to the boxing fans that paid to see it. Chavez Jr. has lost 3 of his last 7 fights since 2012. He hasn’t been busy enough with his pro career, and the inactivity has clearly hurt him. He starts training camp too heavy, and winds up looking weight drained during his fights. It’s a viscous cycle. If Chavez Jr. would simply stay in shape year round, he’d be much better off, but he just doesn’t seem capable of doing that. “I think it’s the truth,” Chavez Jr. said about Canelo testing positive for clenbuterol. ”It was wrong, it was positive in something. I do not make judgements. In sport there are new things, everyone takes advantage of what is new. He was wrong and he was already playing for being rude and arrogant, and not saying the truth, he once told me that I did not represent Mexican boxing because I got positive for marijuana. Now things in life have turned around. He tested positive for steroids,” Chavez Jr. said. I bet Chavez Jr. would like to turn his career around and avenge his loss to Canelo, but sadly that’s unlikely to happen. The hand speed difference between the two fighters is too vast at this point for Chavez Jr. to have any chance of ever beating Canelo unless he suddenly goes downhill.